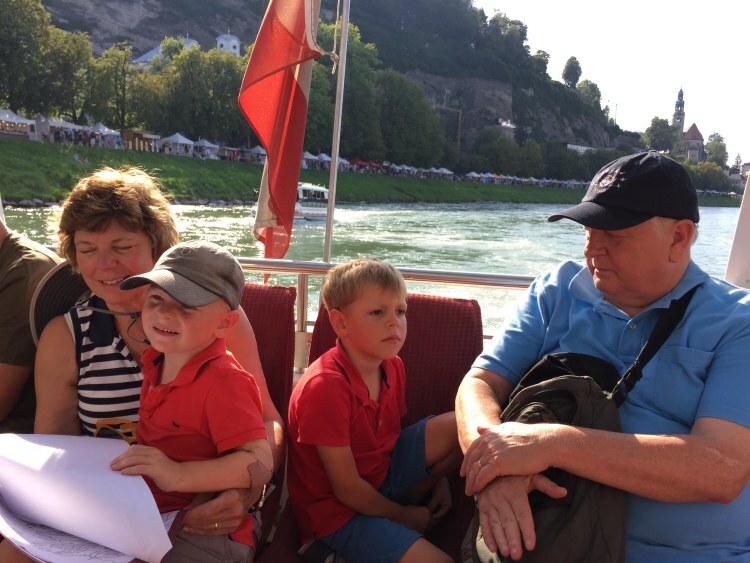 Our visit to Salzburg was HOT. It was July and the heat was absolutely unrelenting. 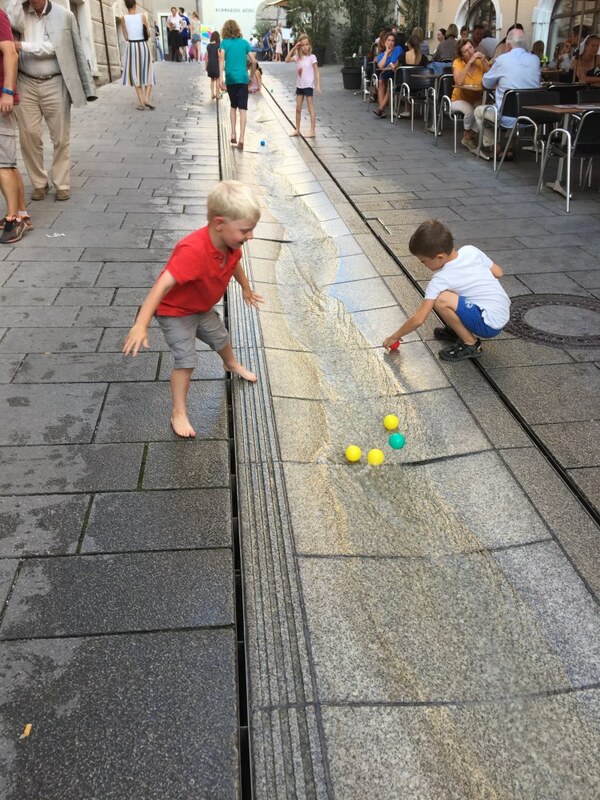 Luckily, Salzburg has plenty of fountains which are perfect for beating the heat with kids. 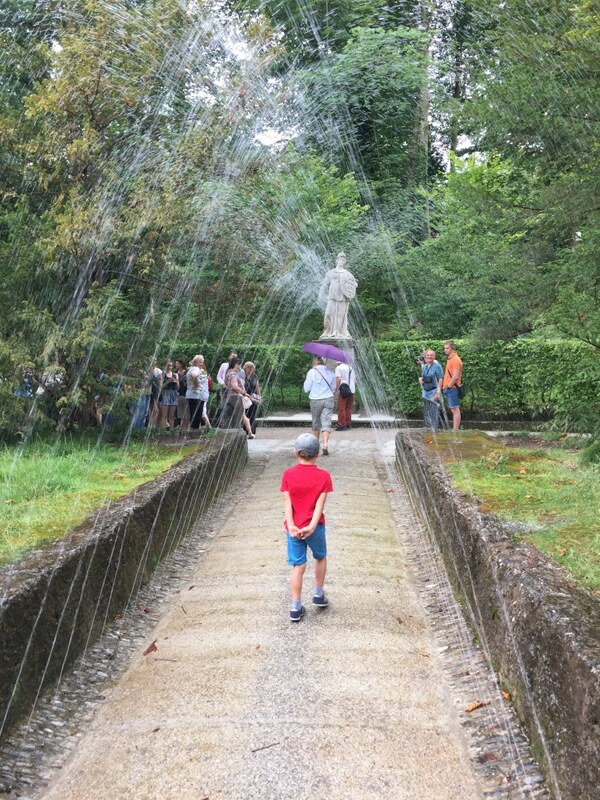 You are sure to get wet on this tour of the trick fountains of Hellbrunn Palace. 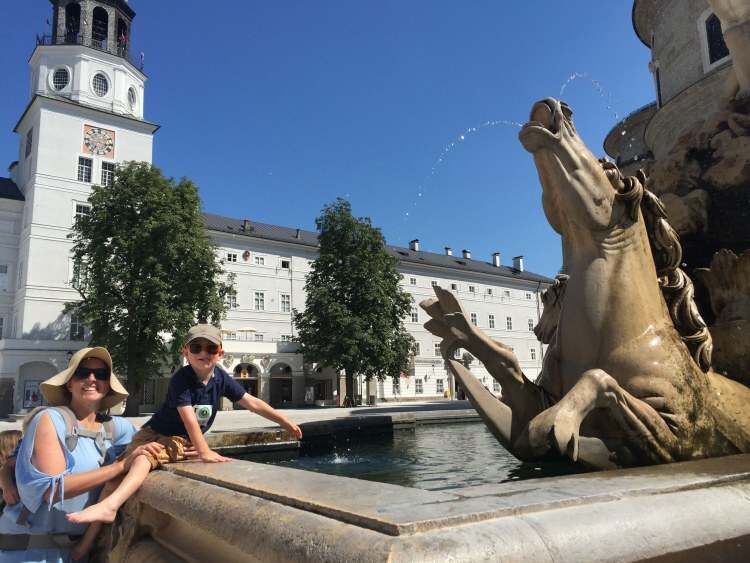 It’s a great tour and worthy of it’s own post, but add this to your list of great places to beat the heat in Salzburg. This amazing fountain provided some of the sweet relief we all craved, plus we ended up grabbing meals in this area more than once. 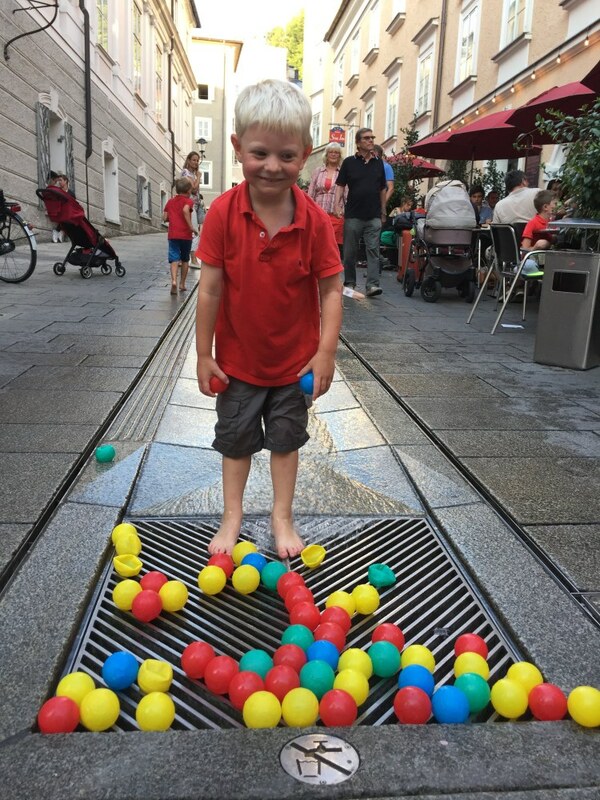 You can find the ball fountain next to L’Osteria, which serves good pizza. 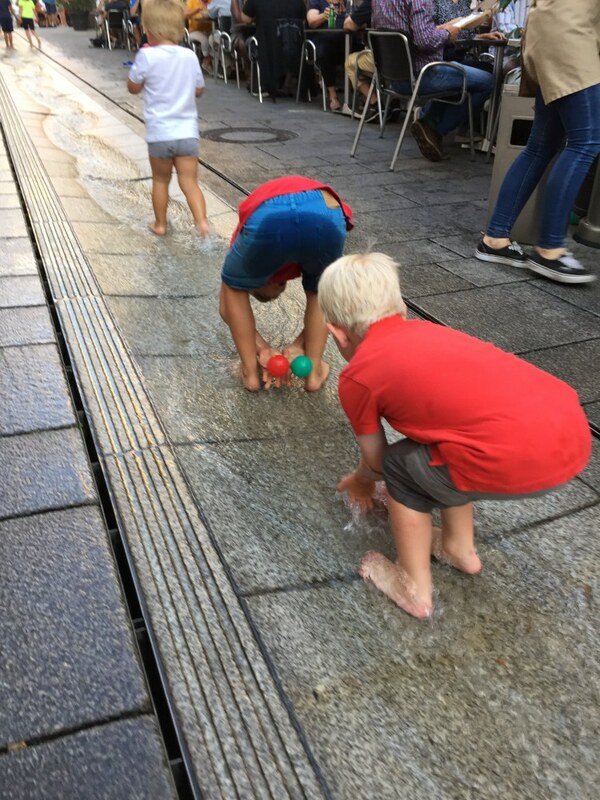 It’s often crowded and is quite touristy, but a seat outside next to this fountain was just what we needed. The boys happily played while we ate. 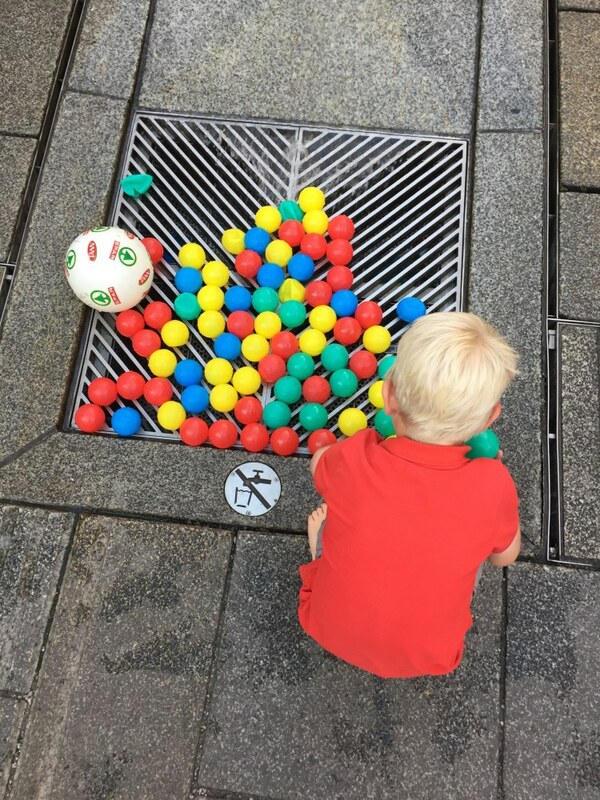 I’m not sure who puts the balls in this fountain but they provided hours of fun. Kids run them up the street, drop them into the fountain and run back down chasing them all the way. The granite blocks surrounding are wet but don’t get too slippery for little feet. The Littles were absolutely soaked! They had a great time though and it helped them stay cool. I wanted to just lay in this stream of water. My only complaint about this fountain is that it’s on a “mostly” residential street. There are some taxis that come through to get to the hotels at the top of the street. They were not at all patient with the kids and it can create a bit of a dangerous situation. We made sure to keep one adult near the kids to help clear them out of the way when a car came. These cars often carelessly run over the balls as well. They really should just close this street in the summer and let everyone run amok. 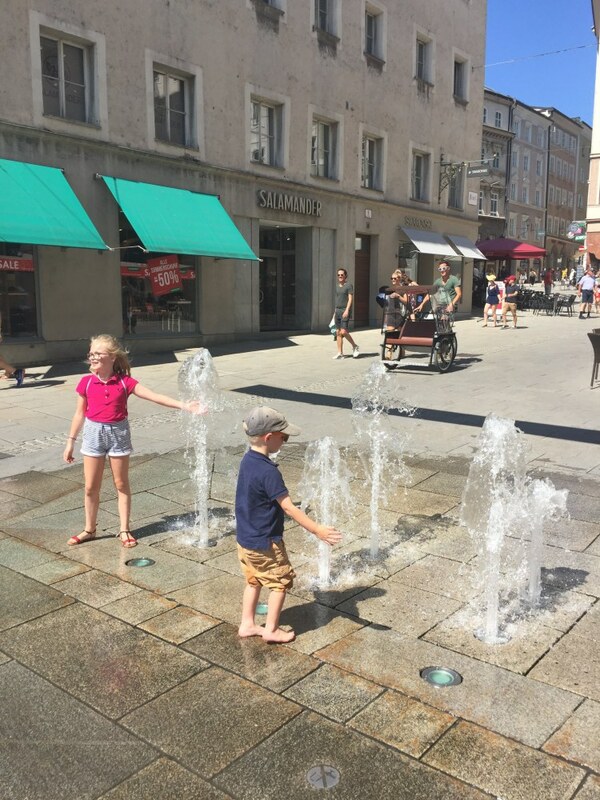 The Residence Fountain in Residenzplatz square made a famous appearance in The Sound of Music. Maria walks by and gives the fountain a big splash. We knew we had to try this out! 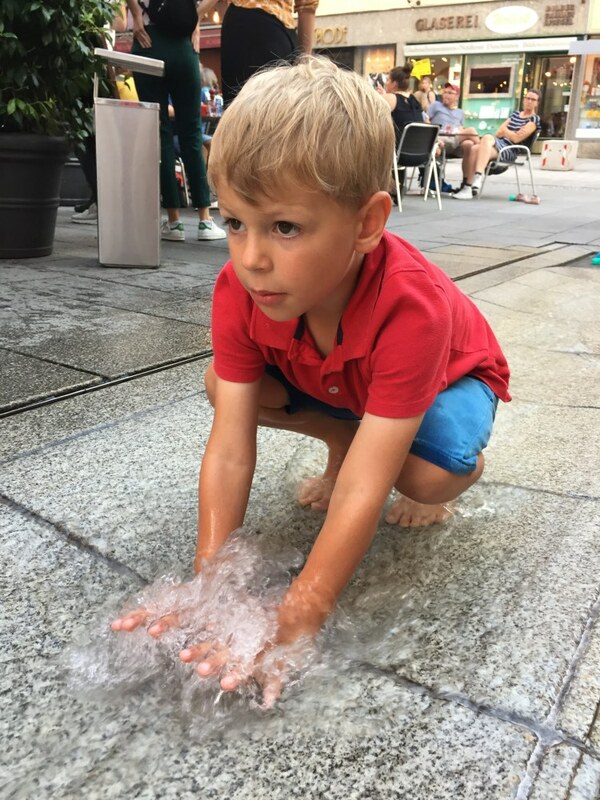 It felt refreshingly cool both to be splashed and to do the splashing. 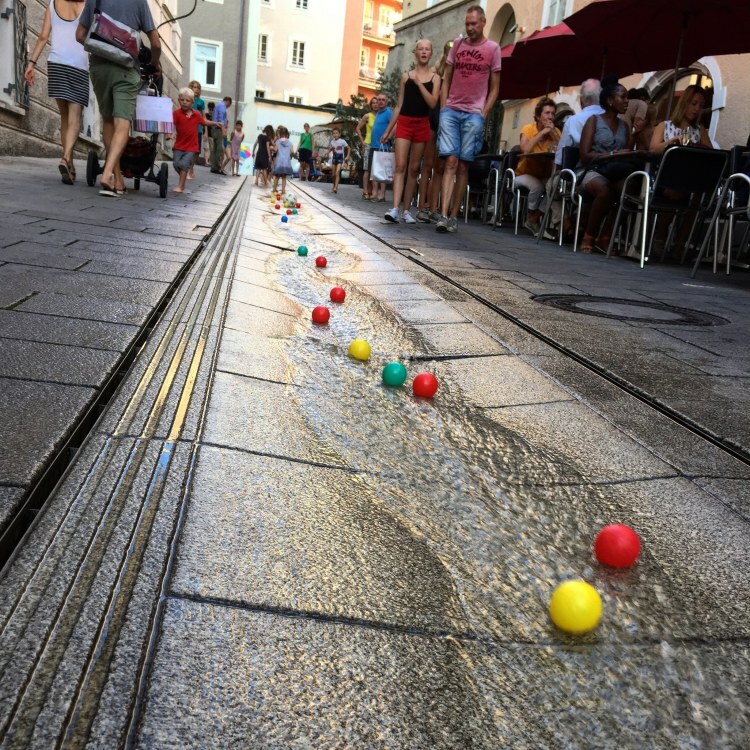 The fountains on the Platzl, just across the bridge from old town, are perfect for getting soaked in. The Littles loved running through these every time we passed by. 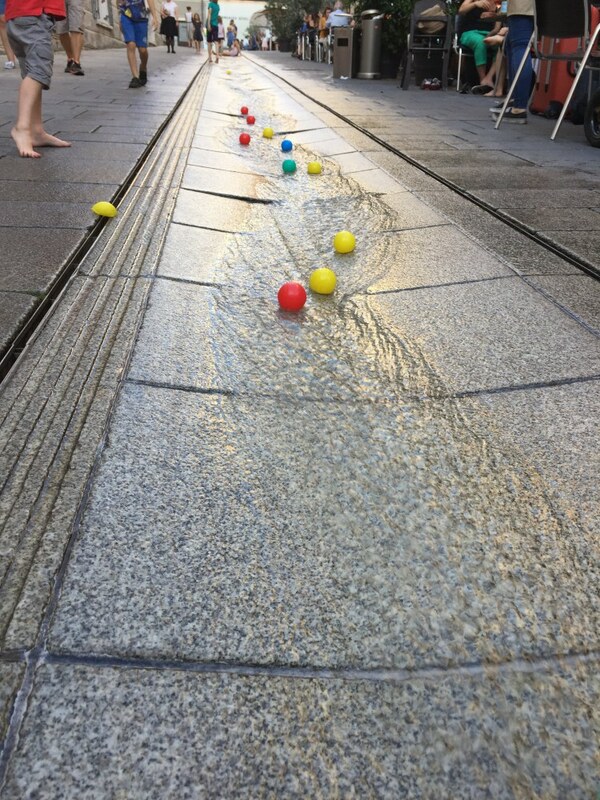 The fountains bounce up and down at different rates making them quite fun to run through. Beware adults, the timing is tricky so you’ll probably get wet! You can also beat the heat by hitting the river. Our Salzburg River Cruise was included with our Salzburg Pass. We paid extra to sit outside (3 EUR pp), where we could enjoy the cool breeze. The River Cruise itself is not that great. There is not much to see by the river, but it is so much cooler out on the water. It’s also nice to go under all the bridges that you spend your time crossing while in the city. There are cruises that take you up the river a bit farther and come back by bus. Those are likely a better value. I always like to have some books and activities with us that relate to our trip. 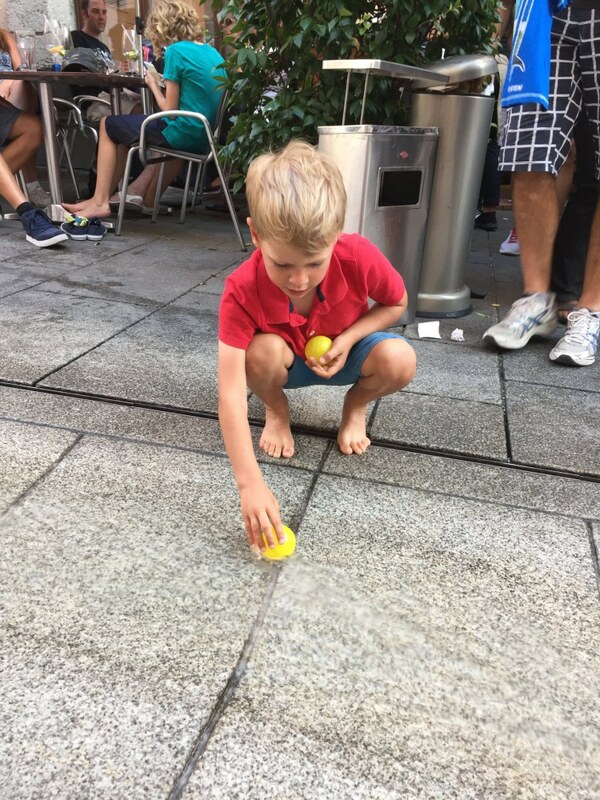 It’s a great way to keep the kids entertained and engaged. This post contains affiliate links. 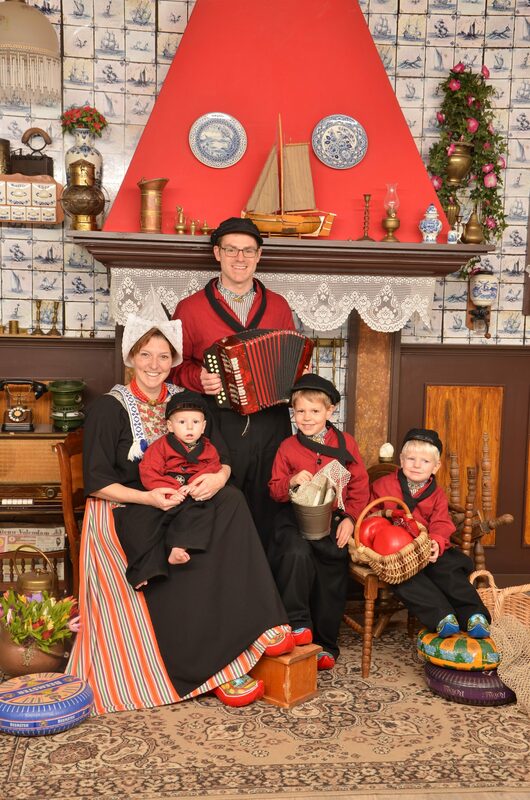 Purchased made through these links result in a small payment to Dutch, Dutch, Goose! at no cost to you. All opinions are of course my own.